Since 1987 Western Construction Systems has been a local Northwest-based specialty foundation repair contractor. One of our specialties is concrete crack repair. We have perfected several repair methods to accommodate different needs and requirements depending on what is needed for your project. Crack injection is a common method of structurally repairing and/or waterproofing concrete cracks. This is one of our most common methods of repairing/waterproofing foundation cracks. This process allows us the ability to fully fill and seal cracks working from one side of the foundation. In most cases this eliminates the need to excavate from the exterior. We can effectively seal the entire span of the crack using our pressure injection system working from inside a basement. Typically this process has a 7-10 year warranty. 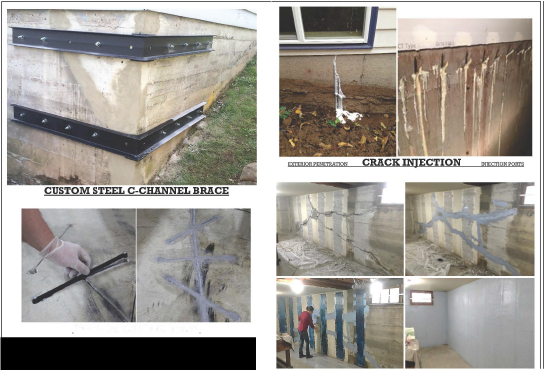 Specialty foundation staples, custom steel braces and reinforced mortars are other repair options we often use when injection is not the most appropriate fix. Not all cracks are the same. Not all cracks require structural repair. Not all cracks need to be waterproofed. Your project manager will inspect your project and determine the most appropriate repair.